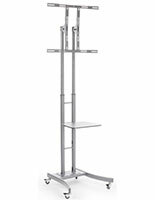 This flat screen digital presentation stand in metal with a silver finish offers height-adjustability to seven set positions (4' to 8' high), using the included Allen wrench. 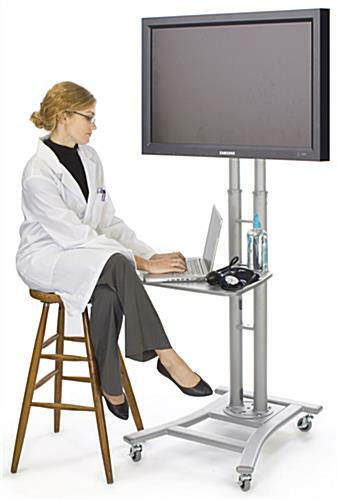 This style media furniture is convenient for electronic advertising displays as well as training or workstation use because the shelf and screens offer adjustable, customized views. 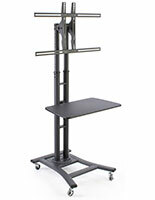 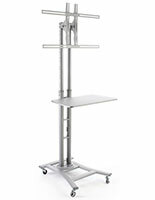 Each widescreen digital presentation stand, also known as a portable monitor holder, features a rotating MDF equipment shelf with height three settings for convenience. 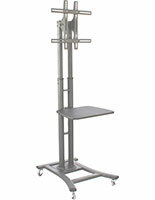 This fixture has four wheels that lock, which is great for mobility during transport as well as stability during use. 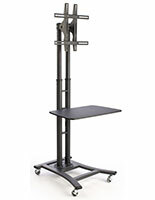 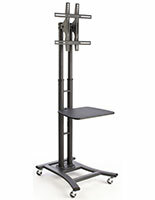 This VESA comptatible presentation stand ships with all included hardware needed for assembly and to mount 37" to 65" monitors to the VESA-compatible bracket. 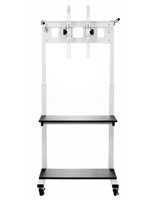 Our online store is your go-to online supplier for affordable, high quality LCD furniture for training, media displays, advertising, and more! 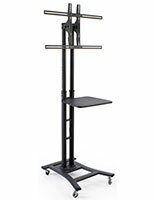 Please Note: This stand supports horizontal monitor mounting ONLY.